Donde el Guaton–or roughly translated, “Home of the Fat Guy”–is a classic Chilean picada (hole in the wall restaurant) in Santiago at the intersection of Eliodoro Yañez and Av. 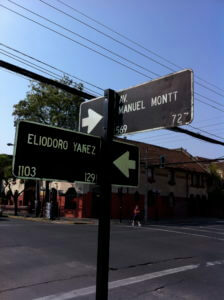 Manuel Montt in Providencia. 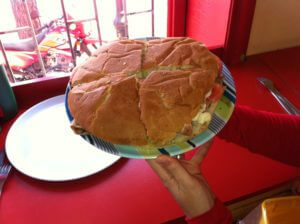 Chileans love their sandwiches–or sánguches–and Donde el Guaton delivers spectacularly large servings. Review the menu carefully and be prepared to share your sandwich with a friend. You can choose from classic variations of the lomito (a pork sandwich), the churrascos (steak), chicken, and massive completos (giant hot dogs loaded with toppings). 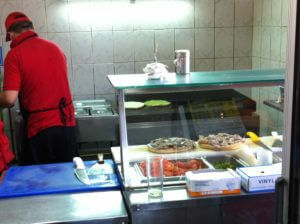 The restaurant is small, has a few tables and raised bar/countertops for eating. 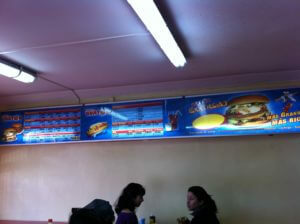 You place your order and pay at the caja (cashier). You are welcome to watch as they prepare your food in the open kitchen. Consider yourself a master if you can eat their large sandwiches without a fork and knife. Don’t be embarrassed if you do need silverware, as many locals use them, too. realmente esos sandwishes son espectaculares….con uno de esos comen hasta 4 personas..creo que de todo lo que he recorrido en Santiago esos han sido los mejores y por pocas lucas….